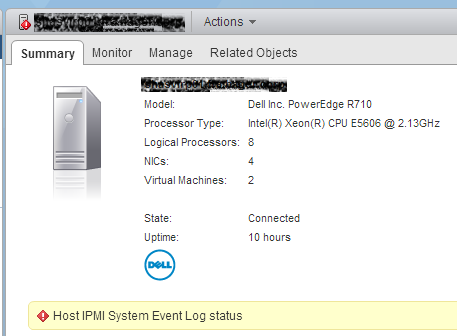 From time to time you can get a critical event for an ESXi host: “Host IPMI Event Log status”. While everything keeps working, your host will remain in a critical state until you solve this error and you could miss another, bigger issue. For a long time, the official workaround was to clear the event log in the Hardware Status tab of the host. However this never really worked out so well for me; many hosts would just ignore my GUI efforts to clear out the logs. And in any case, automation was a challenge. In the latest ESXi versions we finally have a new localcli command line to clear these logs. Here we go! Enable SSH on your host (or connect directly to the console). Wait until the services restart, then disconnect from the ESXi server. Back to the GUI, disable SSH and make sure the critical state is gone. This can take a few minutes! If you’re interested in automation to solve this error, have a look here! This entry was posted in VMware and tagged ESXi, vSphere on 25 October 2014 by Fried.